This couple created such a meaningful set of Engagement and Wedding rings: Her engagement ring is made using a diamond from her father-in-law’s old ring, reset into a plain solitaire setting. The casing that remained after removing the Diamond, is now set with a Blue Sapphire with a modernised bezel setting, and worn by the husband as a wedding ring. We sourced a Blue Sapphire to fit into the empty ring casing. In turn, his Blue Sapphire inspired her wedding ring, which is an eternity ring made up of Blue sapphires. We also made it curved so that it would sit nicely when worn together with her engagement ring. 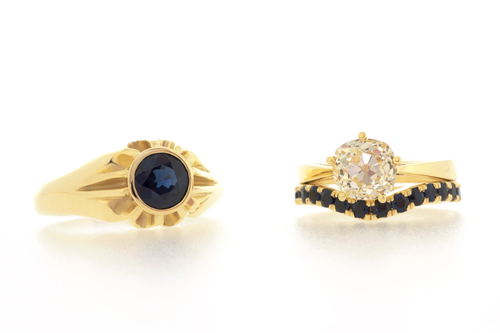 It is such an inspiring set of rings, where each piece is made in relation to the other. 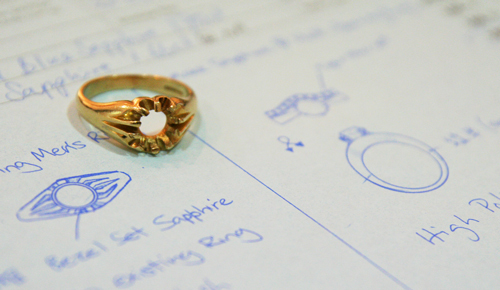 This is a great example of how to redesign existing jewellery, as they often have sentimental value.